Japan likes what we do, how we do our garbage By Fiona Isaacson They travelled more than 10,000 kilometres to visit Halifax but they didn't come for the beautiful ocean view - they came to see our garbage. Teiichi Aoyama, Komichi Ikeda and Tsuguo Hirota arrived Wednesday from Tokyo to tour Nova Scotia's composting, recycling and landfill facilities. Mr. Aoyama and Ms. Komichi work for the Environmental Research Institute, and Mr. Hirota, is a lawyer associated with a citizens' waste management group. Ms. Ikeda said more than 70 per cent of Japan's garbage is incinerated, causing dioxin pollution. Depending on the level and duration of exposure, dioxins can cause skin conditions and sometimes mild liver damage. There is also concern that they may increase the risk of cancer and have reproductive or developmental effects. The visitors came to learn about Nova Scotia's system in hopes of changing Japan's, an issue they've been tackling for five years. "I am very interested in the Nova Scotia system from the viewpoint of economy, employment and waste management. There is no such viewpoint in Japan,"
Mr. Aoyama said. The group hear about Nova Scotia's system in a video made by Paul Connett, a professor at a New York state university. The province adopted its waste strategy in 1995 and since 2000, has been diverting 50 per cent of its waste. In Japan, Ms. Ikeda said, there are 1,800 municipal incineration sites. For more than 50 years, they have burned everything except glass, cans and 45 per cent of newspapers. "We would like to reduce the (number of) incineration plants because the environmental risk is very high. Dioxin, hydrocarbons and ashes are left (as well as) heavy metals," Ms. Ikeda said. Dioxin levels in Japan's air and soil are 10 times higher than in Europe and North America. In the 1970s, there were hundreds of disposal sites in Nova Scotia, and as recently as 1996, there were 40 to 50, 20 of which allowed open burning. Today, 18 landfill sites remain, and no waste is burned. The three are also interested in the level of community involvement in decision-making on the matter here. In Japan, there is no public consultation, Ms. Ikeda said. Barry Friesen, the Environment Department's solid waste-resource manager, said the visit was a good opportunity to exchange ideas. "We've been asking a lot of questions about electronics recycling," he said. In Japan, the law requires makers of household appliances and electronics to participate in the recycling process. In Nova Scotia, municipal taxes pay for this recycling. The visitors were "thrilled to see new products that are made out of waste products - products that would go into their incinerator," he said. 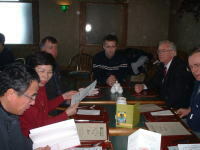 The delegates will make presentations about Nova Scotia's system upon their return to Japan. "We're proud to show (our system) off and help others achieve the same goals," Mr. Friesen said. Hirota Tsuguo, a Tokyo Japan lawyer, takes pictures at the Kemptown materials recycling facility as Teiichi Aoyama, right, and Komichi Ikeda are told how the workers sort recyclables by Alanna Nelson, the waste reduction educator for Colchester County. Some Nova Scotians may have trouble pinpointing Kemptown on the map. But people on the other side of the world know exactly where it is. Nova Scotia1s success in diverting waste from landfill sites by 50 per cent in a few short years has caught the attention of conservationists around the world. Komichi Ikeda, the deputy director of the Environmental Research Institute based in Tokyo, said it1s time to change attitudes in the island country of 120-million people where most of the garbage is incinerated before being buried in landfill sites. Ikeda said 50 per cent of the waste in Japan comes in the form of compostable material from the kitchen. She came to Nova Scotia, along with Teiichi Aoyama and Hirota Tsuguo, to find out how Nova Scotia met the waste diversion goals. There are 2,000 household waste sites in Japan which are used to store the ashes from 1,800 residential incinerators. There are another 20,000 incinerators for industrial waste in the country, said Bob Kenney, an official with the Nova Scotia Department of Environment. 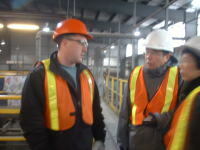 Kenney was taking the delegation on a tour of Halifax and Colchester recycling, compost and balefill facilities. Japan burns almost all of its garbage. The emissions from the incinerators have many people worried about the environment and the effect on peoples health. Ikeda said the federal government is looking at options to burying its garbage but there is a long way to go to change peoples opinions. Ikeda works for an environmental lobby group and hopes to influence the government with the information she brings back from Colchester County. Darlene Proctor, Colchester County1s waste reduction co-ordinator, said one of the things that makes Nova Scotia unique is the interplay between government regulations, municipalities and funding options. Without the provincial regulations, she said, municipalities would have no incentive to build second-generation landfill sites like the one in Kemptown. The role of the Resource Recovery Fund, which pays out credits to municipalities that divert waste from dumps, has also helped spur the move to more concentrated recycling efforts. The credits take the form of cash contributions based on an elaborate equation. Alanna Nelson, Colchester’s recycling educator, said she conducts about 30 tours of the facility every year. About half a dozen are from outside the country including officials from Asia, Europe and the United States. “They come here because they want to see how Nova Scotia reached the diversion goals it did in such a short period of time. Kemptown is a modern facility and one of the focal points for the province,” she said.